Sometimes it blows me away to see how God always gives us the support we need to persevere. A small, yet potent, example of his provisional care in my life came this past year while teaching bimonthly art classes. Colleen and her family starting coming mid year – and their presence was like a refreshing glass of Sprite amidst what felt like a “cracker-dry” type of year. Colleen’s smooth, joyful style and the energy of her children were just what “art class” needed this year – and in hindsight, I see how the Lord moved them like chess pieces to attend exactly when they did! Now I could elaborate about how there will be times when God will use YOU like this – where the very essence of “you” is a blessing to someone. There will be times when the way that YOU are wired is just what someone needs – a time when the aroma of “who you are” is a social gift and when that happens – it is truly wonderful. However, to keep this post a bit lighter, I thought I would expound on the poetry angle of writing about something fun like SODA! ~Writing about soda – and other simple things – can be another reminder about how writing topics do not alway have to serious or super deep – they can be fun, simple – and even bubbly! ~Ellington’s soda poem takes advantage of “shape” – where the arrangement of the words match the carbonated, bubbly feel of real soda. 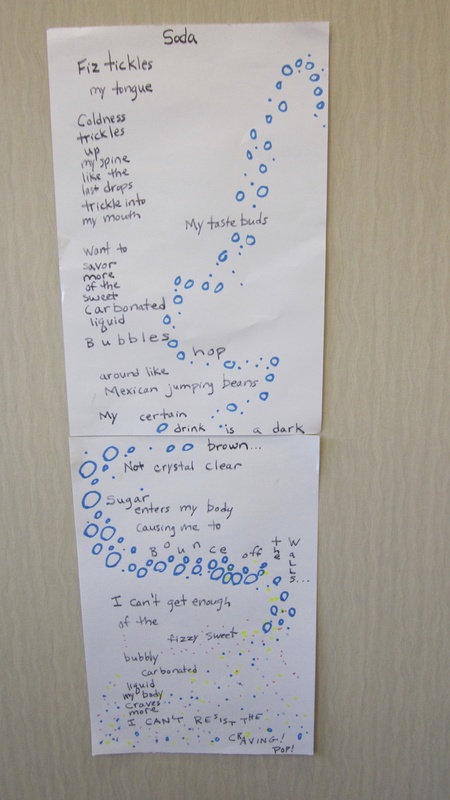 ~Have your student write a SODA poem (or different topic) that places words in various orders – and shapes – that will add to the theme of their poem. Encourage students to write about something fun, simple, and maybe even something that refreshes them this summer (and later this poem can remind them of this special time in their life). ~Remind students (and adults) that consuming soda should be done in moderation – or not at all! Many sports coaches put soda on the AVOID LIST because the high fructose corn syrup is not healthy and the phosphoric acid in soda throws off the body’s calcium and magnesium balance and pulls from bone health. Also, if you are consuming anything with aspartame in it (like diet soda)- well don’t complain when cancer develops in your body later on because aspartame is BAD for you – poisonous – even in small amounts. Also be careful with regular soda because many “regular” sodas are now sneaking in aspartame, High Fructose Corn Syrup, artificial sweeteners, artificial colorings, and more junk – all because it is cheaper than real sugar and natural items- so read all labels before buying and drinking! there are hundreds of cans. I drank a third can just now. B u r r r r p! I wanted four – but my stomach can’t fit anymore!